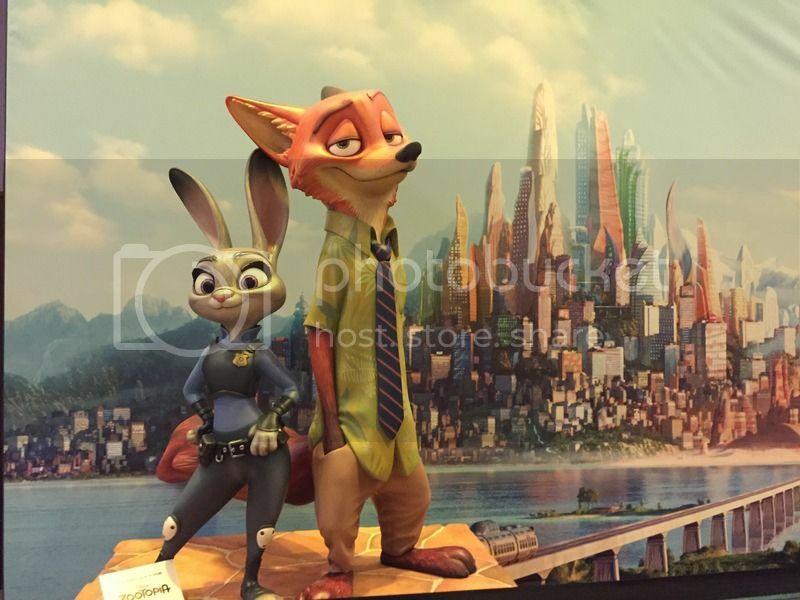 Zootopia is the latest 3D computer-animated movie from Walt Disney Pictures, and the 55th animated feature in the Walt Disney Animated Classics series. This film is a mixture of things, let’s see if I can sum it up… it’s an underdog story, neo-noir, buddy-comedy, adventure film, that follows the unlikely partnership between a rabbit police officer and a sly hustler of a fox, together they unearth a conspiracy involving missing citizens of the predatory descent. It’s directed by Byron Howard and Rich Moore, and co-directed by Jared Bush. It has a screenplay by Jared Bush and Phil Johnston. 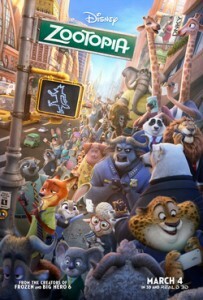 The film features the voices of Ginnifer Goodwin, Jason Bateman, Idris Elba, J.K. Simmons, Tommy Chong, Octavia Spencer, Jenny Slate, Shakira, and Maurice LaMarche. The good; this film looks amazing! The rendering of the fur on the animals, the weather, the night time lighting, a lot of care was taken into the details and it shows. Like in Wreck-It Ralph the animators had to create multiple worlds, in Zootopia there are four different climates, the care and detail that went to that world building is wonderful. One particular example that stuck out was when Judy Hopps (the rabbit officer) chases a perp into a rodent district of the city where everything is tinier than she is, and she’s already tiny. The scenery looked as if someone built a scale model city and then animated the rabbit running through it, I was really impressed with that chase scene. I could go on and on about how beautiful and realistic this film looks, but you have to see it for your self. The other aspect of this film that takes center stage is the story. Let’s follow Judy’s journey, as she’s our main character. On the surface it’s an inspirational underdog story of the little guy… ermm girl, in this case a female rabbit. Judy wants to be in a profession that no other rabbit has been in, yet she defies society’s notions and becomes the first rabbit police officer, and we’re right there as she starts on her journey to prove that size doesn’t matter in life. Then she uncovers a conspiracy that’s plaguing the city and its safety, her sense of duty shifts in and she has to follow the trail all the way to the top, no matter what. Other other main character is Nick Wilde, a fox who’s a con-artist. People look down on foxes because they think they’re shifty and up to no good. Nick’s more faded and world-wise, he tries to impart his wisdom on to Judy, but they’re forced to work together and that’s where the buddy-comedy aspect comes in. The polar opposite characters have to work together in the circumstances, in this case it’s a city endangering conspiracy that has social and topical metaphors. That social message was not expected in an animated movie, bravo for teaching us something. The bad; you haven’t seen this movie yet?? Overall, one of the best looking films to date, color me impressed. But what’s even more impressive is that the amazing visuals match the beautiful story. The friendship between the rabbit and the fox is well earned and fought for. There’s a noir story that’s reminiscent of Chinatown coupled with a metaphor about racism like Enemy Mine, all wrapped up in a buddy-comedy like 48 Hours. There’s something here for everyone in the family, lots of easter eggs throughout (The Godfather, Breaking Bad…). Do yourself a favor and watch Zootopia on the big screen.